Hi friends! Very delicious and easy coriander chutney that goes well with stuffed parothas or snacks or can be used as spread . Try to make Coriander chutney with onions following this easy recipe. Take coriander, wash it very well and chop it, and keep aside. Peel, wash and chop the onion, green chilis and tamarind. Put all these ingredients along with salt and 1/4 cup of water in a grinder. Grind all the ingredients with water till smooth. Refrigerate till required. 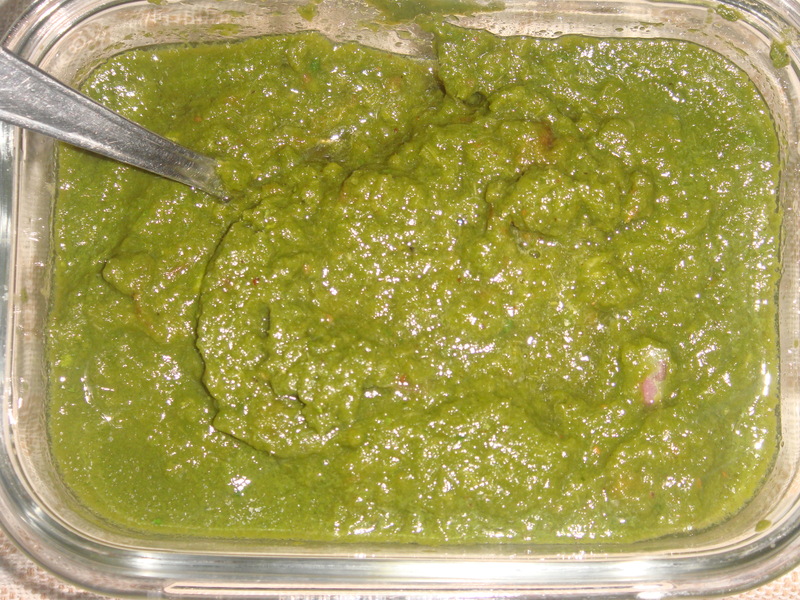 Note: There are many variations of coriander chutney. This versions of coriander chutneys is basic. It goes very well with all Indian snacks and sandwitches.It can be stored for 8-10 days in the refrigerator. •Cilantro is also used to prevent and treat infections caused by bacteria and fungus. •Cilantro is rich in minerals that may be valuable in maintaining overall health. Cilantro leaves are rich in calcium, potassium, manganese, magnesium and iron. Research has shown that low potassium is associated with a risk of high blood pressure, heart disease, stroke, arthritis, cancer, digestive disorders, and infertility. While iron is essential for red blood cell production. Calcium and manganese is essential in treating and preventing weak bones (osteoporosis) and can help reduce spinal bone loss in older women. •Cilantro seed oil has a reputation in many traditional medicines as an anti-inflammatory agent, an analgesic, anti-diabetic, anti-spasmodic, carminative, digestive, fungicidal, and has cholesterol-lowering effects. These health benefits are due to the abundance of phytonutrients found in Cilantro’s volatile oils, these include carvone, geraniol, limonene, borneol, camphor, elemol, and linalool. •Cilantro is also rich in flavonoids that are considered antioxidants, these include quercitin, kaempferol, rhamnetin, and epigenin. Cilantro also contains active phenolic acid compounds, including caffeic and chlorogenic acid. •Cilantro contains natural antibacterial compound called dodecenal that is safe and effective against Salmonella, a deadly bacteria that is the cause of foodborne illness. •Cilantro leaves have sufficient antioxidants, phytonutrients and fibers that actually help in maintaining good level of HDL – known as good cholesterol while reducing the LDL level. – the bad cholesterol. •Cilantro is also beneficial in maintaining good skin and mucus membrane because it is rich in folic-acid, riboflavin, niacin, vitamin-A, beta carotene and vitamin-C. The rich vitamin A is important in protecting the vision, lungs and other vital organs.